Lindernia dubia var. anagallidea (L.) Pennell (Michx.) Cooperr. Low annual herb from fibrous roots; stems ascending to erect, 5-20 cm tall, slender, branched, smooth. Opposite, unstalked, egg-shaped to elliptic, 0.5-2 cm long, entire to obscurely few-toothed, 3- to 5-veined, smooth. Inflorescence of single stalked flowers in the leaf axils, the thread-like stalks longer than the leaves; corollas blue-violet to whitish, narrowly bell-shaped, 6-9 mm long, 2-lipped, the upper lip with 2 short teeth, the lower lip longer, projecting, 3-lobed, the throat with 2 yellow-hairy ridges; calyces of 5 nearly distinct, equal, linear segments, 3-4 mm long; fertile stamens 2. Capsules, ellipsoid, 4-6 mm long; seeds numerous, yellowish, 0.2-0.4 mm long, smooth to finely net-veined. Wet, sandy or muddy banks and shores in the lowland and steppe zones; rare in SC BC and the lower Fraser Valley; disjunct E to ON and S to NH, NY, SC, FL, MS, TX, UT, AZ, CA and MX; S. America. 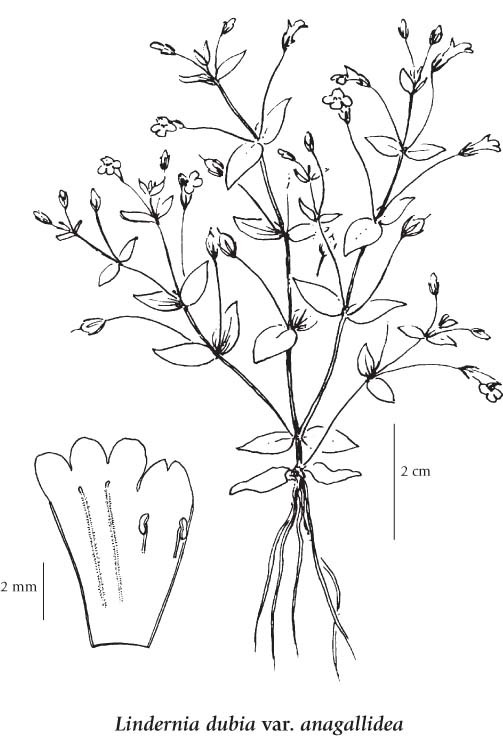 Ilysanthes anagallidea (Michx.) B.L. Rob.